COLLECTIBLE O-RING GIFT. Only until stock lasts. Peter Pan (Williams) has grown up to be a cut-throat merger and acquisitions lawyer and is married to Wendy's granddaughter. 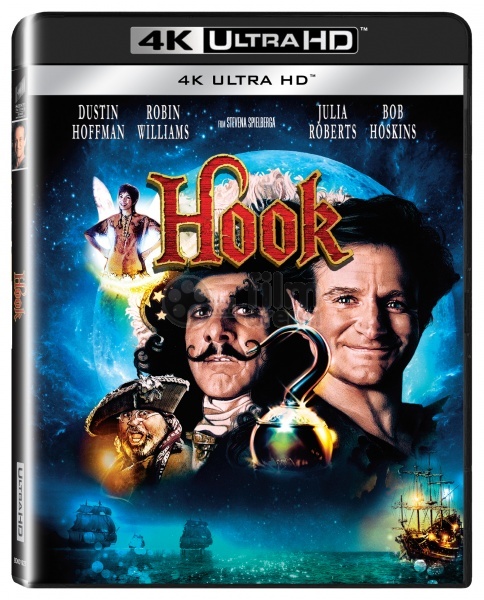 Captain Hook (Hoffman) kidnaps his children, and Peter returns to Never Land with Tinkerbell (Roberts). With the help of her and the Lost Boys, he must remember how to be Peter Pan again in order to save his children by battling with Captain Hook once again. It is the present day, and the boy who was once known as Peter Pan, has become Peter Banning (Robin Williams), a businessman who is more concerned with his work than with his family, including his wife Moira (Caroline Goodall), and his two children, Jack (Charlie Korsmo) and Maggie (Amber Scott). Peter is hardly able to hold his attention during Maggie's recital of 'Peter Pan' (of which she is cast in the role of Wendy), and misses Jack's baseball game, leading to Jack growing irritated at how his Dad never seems to keep his promises. The family then take a flight to London (much to Peter's dismay, as he hates flying), to visit Granny Wendy (Maggie Smith), who is being honored for her charitable work. While Peter and Moira accompany Wendy to the party, Maggie and Jack are abducted. Liza (Laurel Cronin) the housekeeper saw noone, but Tootles (Arthur Malet) who is a former Lost Boy, tells Peter that it was Captain Hook (Dustin Hoffman). The police are called, but even they are unsure of the whole thing, as the ransom note could be someone pretending to be Hook, seeing the history of the house, and of Wendy. Afterwards, Wendy takes Peter aside, and explains that he must remember who he is, in order to save his children. Peter is still confused, thinking Wendy is maybe in shock over what has happened. Later that evening, sitting in the house's nursery, Peter is surprised when a star appears to fall through the nursery window. It turns out it's Tinkerbell (Julia Roberts), who has come to help Peter. However, since Peter won't go willingly, Tink kidnaps him and takes him to Neverland. Peter wakes up in Pirate Town, where he is quickly disguised. All around him, pirates are gathering at the Jolly Roger, as Mr Smee (Bob Hoskins) presents the illustrious Captain Hook with a newly-sharpened hook. Hook then revels in the pirates cheering, telling of how he killed the crocodile that had once sought to devour him, and turned it into a clock, and now, cheers at the triumph in capturing Peter Pan's children in hopes to lead him back to Neverland and to his doom. When Peter steps forward (still claiming to be 'Peter Banning'), Hook is saddened to see that his once 'great and worthy opponent' has become a middle-aged man. Still wanting to test him, Hook demands that Peter fly up the ship and touch the fingers of his children, promising they'll go home if he can do so. However, Peter reveals his fear of flying, and Smee deduces that being away from Neverland for so long, has caused Peter to forget. Hook decrees that Peter walk the plank and wanders away, angered at being denied the war against a worthy opponent. Just then, Tinkerbell appears, and promises Hook that given three days, she'll get Peter into shape. Peter and Tink then return to the Lost Boy's hideout, now under the leadership of a boy named Rufio (Dante Basco), who also has possession of Peter's sword from the olden days. At first no-one believes, until a little boy named Pockets (Isaiah Robinson) speaks out. Much to the displeasure of Rufio, the Lost Boys unite to help Peter get his children back. Back with the Lost Boys, Peter is put through his paces with various exercises, and even tries to fly but with no success. The Lost Boys prepare a 'Never-Feast,' which is a meal of make-believe food. Peter finds the whole thing ridiculous, and Rufio makes fun of him, which leads to a game of name-calling, that Peter soon ends up winning. Peter then pretends to scoop up some food and fling it at Rufio. However, this gesture soon causes Peter's imagination to take flight, and the make-believe food now becomes real! Meanwhile, Hook attempts to turn Maggie and Jack to his side, claiming that parents hate their children. Maggie refuses to believe this, and is dragged away, while she yells for Jack to not forget their Mom and Dad, and to find a way to run home. While Maggie is not easily swayed, Jack's ire towards his Dad allows Hook to turn him easily. Finding a watch on Jack that Peter had given him, Hook and Smee lead Jack to a shop full of smashed up clocks, letting Jack work out his aggressions about his Dad by smashing the clocks and Peter's watch. Sometime afterward, a ballgame is held with Hook in attendance. Peter and the Lost Boys have also snuck over to the game, with some of the boys feeling that if Peter steals Hook's 'hook,' it'll provide him with the happy thought to fly with. However, Peter sees Jack make a home run, and Hook embrace 'his' son, yelling, 'my Jack!' The vision of Hook cheering on and holding his son causes Peter to run back to the Lost Boys hideout, where he attempts in vain to try and fly. Looking around, Peter soon finds Hangman's tree, and the secret entrance inside. As he looks around, Tinkerbell appears, explaining that Hook had found the tree and burned it when he didn't come back. Peter's memory begins to come back, and he remembers his past. Peter remembers his mother, who when he was a baby, talked about grand plans for him. However, as a baby, Peter was afraid of dying, because everyone who grows up has to die someday. A gust of wind blew Peter away in his perambulator one day, and it was then that Tinkerbell found him, taking him to Neverland, where he learned how to fly. Even so, Peter missed his mother, and returned to London, only to find that he'd been 'replaced' by another baby that his parents had. Peter then wandered in and out of open windows, where he eventually lost his shadow in the Darling's nursery, leading to him finding Wendy. Peter would continue to visit Wendy after their first adventure, but as she aged, Peter grew sad, as soon she was too old to accompany him. On his last 'visit' to the nursery, Wendy showed him her granddaughter Moira, asleep in a nearby bed. Upon seeing her, Peter proclaimed he would give her a kiss...but not like the thimble Wendy had once given him, but a real kiss. It is with this revelation that Peter suddenly remembers why he left Neverland behind and grew up: he wanted to be a father. Finding his 'happy thought,' Peter is able to fly again, to the joy of the Lost Boys. Rufio returns Peter's sword, and stands by him as they prepare to go to war with Hook. 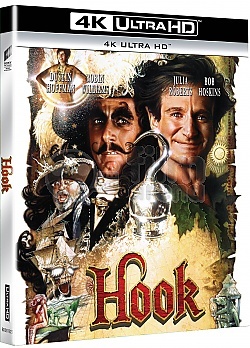 Hook meanwhile, has managed to make Jack forget Peter, and now consider him (Hook) as his father. Peter appears, and is at first taken aback that Jack does not recognize him, but then goes to work, battling Hook's pirates, as the Lost Boys launch their attack. Rufio appears, and fights off Hook, as Peter goes to rescue Maggie. Returning to the Jolly Roger, Peter arrives just in time to see Hook run Rufio through with his sword. With his dying words, Rufio tells Peter that he wishes he had a Dad like him. These words seem to break the hold that Hook had on Jack, who looks to Peter, asking to be taken home. Peter then reunites with the Lost Boys and Maggie, and they begin to leave...but not before Hook vows to continue to threaten Peter's family forever. Peter then jumps back into battle against Hook. After some time, it appears as if Peter has the upper hand, but instead of killing Hook, Peter listens to his children, who beg him not to kill Hook. Peter then tells Hook to leave. Hook then pulls a dagger on Peter, pushing him against the carcass of the once killer crocodile. However, Hook misses, and ends up puncturing the crocodile, who seems to return to life, and ends up eating Hook. With Hook gone, Peter decides to return home, but leaves one of the Lost Boys named Thudbutt (Raushan Hammond) in charge, as he fought courageously in the battle. While Maggie and Jack return to the nursery, Peter ends up in Kensington Gardens, at the base of a statue bearing his likeness. Also nearby is Tinkerbell, who says her farewells to Peter. Peter then returns to Wendy's place, and greets his family, throwing his cellphone out the window when it rings regarding more business matters.